Have you noticed this strange fact?We crave for a particular food/dish/fruit more when its not in season or is not easily available at our part of the world.. 🙂 This is strange but true.Its October and I crave for Mangoes.So I satisfied myself with some tinned Mango 😦 …though its taste comes no where near a fresh juicy and ripe mango 😦 .. This is my mother’s recipe…its simple and easy and a perfect recipe.I strongly recommend to use gingelly oil in this recipe.It imparts that typical nadan ruchi(taste) to the achar(pickle). In a big bowl,take the chopped mango pieces.Add salt to it and mix thoroughly.Leave aside(covered with lid) for about 8 hours,preferably overnight. After 8 hours/overnight,heat oil in kadai/or deep pan.Add mustard seeds and when it splutters,add the curry leaves and Dry red chillies.Then add the crushed ginger and sliced garlic and saute till the raw aroma disappears. Now add the powders from ingredients 8 to 10.Saute for 1 or 2 minutes and then add salt and then water and bring to boil over a low flame until thick.Remove from heat. To this add the Mango pieces(from step 1) and combine well.Add salt is needed.Allow to cool.Transfer to clean and dry bottles.Leave aside for two whole days in a cool dry place. 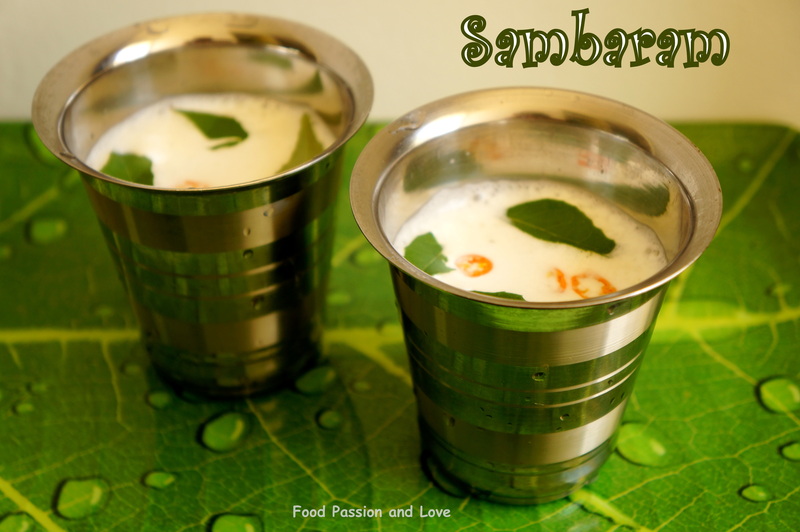 After that serve when needed with a clean dry spoon, along with Curd Rice/Thayir sadam or plain Rice.Enjoy!! 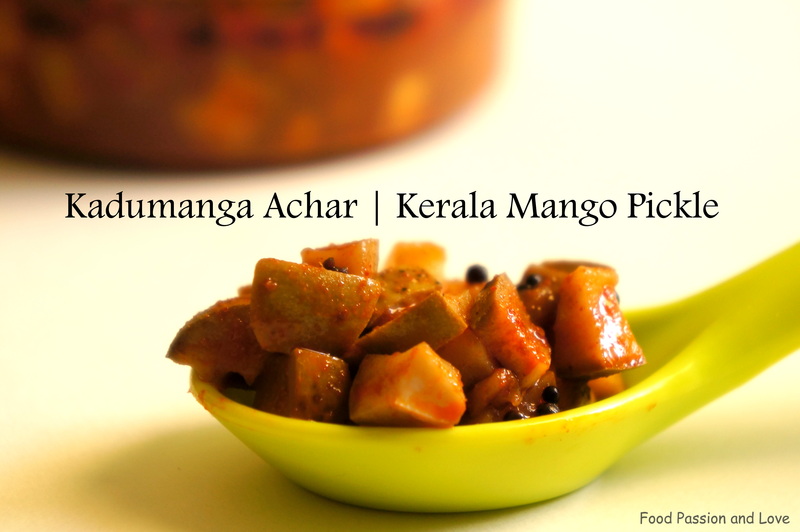 This entry was posted in Uncategorized and tagged curd rice side dish, indian, Kadu manga achar, kaduku manga, kerlala achar, mango pickle, pickle, southindian mango pickle. This drinks to my mind those memories of my dearest grandfather..who used to love farming a lot.He was a college principal and a Botany professor,a chancellor at a famous university,an Ncc Major..the list is endless…back from college,he spent his time and energy in in our backyard….a really simple man.He had that special love towards farming in our parambu(huge farm behind the house)..where there used be a zillion different varieties of trees and plants..It used to be a pleasure taking a walk in the parambu with the wind blowing through the sugar canes and bamboo trees..the swaying Thengu(coconut trees..if i start taking about his plants and plantations..this post would not suffice!He was truly a man with a green thumb…!It was my duty(being the only grandchild) at those times, to carry for him this Pacha moru,prepared by my grandma, in a steel jug.I used to take special pride in doing that…He was a person I respected and admired a lot right from my childhood.Now he is no more..He was a highly respected man in the society and a truly handsome gem of a man, a pride of his children,grandchildren and great grandchildren!Even now when I go back for holidays to my native in kerala during holidays,I am still known to people and places where I go as his grand daughter!Memories of him truly brings tears to my eyes ..This post is dedicated to my dearest Vellya papa(Grandpa)!! Add the water to the chilled yoghurt and whisk well.To this add chopped (green chilly,curry leaves and ginger).Add salt and whisk well again. Transfer into serving glasses and serve chilled and Enjoy!! This entry was posted in Uncategorized and tagged gods own country, keralam, moru, naatumpuram, nadan paneeyangal, no cook moru curry, pacha moru, sambaram, spiced butter milk, Thani nadan. Todays is a very simple but extreeeeeeemly delicious post…its “THE AAMRAS”…I am a mango lover…And I totally love aamras.I can eat it 3 times a day.. 🙂 forever 🙂 I came to know about Aamras from my mother in law…from her stories as a young bride,newly married in Mumbai…and their Maharashtrian friends,dinner evenings,and travels..her stories are endless..It is she who gave me the recipe of this “mango heaven”. Aamras as the name suggets is nothing but mango juice..Aam being mango and Ras meaning Juice..Basically its nothing but Mango pulp..or may be Mango nectar.Alphonso mangoes are perfect for making aamras..though you can also use just any variety..the only things is that the Mango variety should not be the fibrous kind.I make this extensively during the Mango season with Pooris and even Rotis.You can even have it as a dessert after a meal.I like my aamras cardamom flavoured..because I just love the flowery scent of cardamom with Mangoes.You can also use dry ginger powder instead of cardamom according to your preference. Clean/wash the mangoes.Peel and chop them and add them into a blender. Then add powdered cardamom,sugar(if needed),milk and blend into smooth puree. Transfer to small bowls and refrigerate. 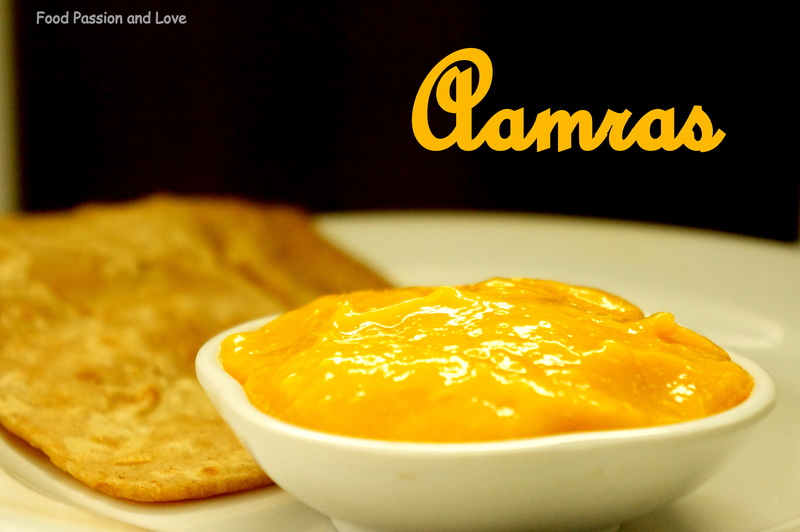 Serve with hot pooris/chapathis and Enjoy!!! This entry was posted in Uncategorized and tagged Aamras, alphonso, cardamom flavoured, Chapathi side dish, chilled, easy dinner, gujarati dishes, how to make aamras, maharashtrian dishes, Mangoes, roti side dish. Hellloooo!Do you experience those lazy afternoons when you cant resist the urge to have something sweet and chilled after lunch?Well..I am one of those persons!During my college years,I used to argue with my Mom when I used to see her nibbling on some thing sweet after lunch…ofcourse thinking of health reasons..But now me being in my early thirties..I find myself doing the same thing 🙂 Hope my Mom doesnt see this post ha ha! So today this urge led me to make this eggless Apple Custard.Its extremely easy and your family will love it to the core!! Take about 1/4 cup of milk from the 2 cups of milk mentioned above in a bowl.To this add the custard powder and dissolve well by stirring. Boil the remaining milk in a sauce pan. To this add the custard powder dissolved in milk, slowly and stir well continuously.It will get thick immediately,so be careful.After few minutes,remove from heat and allow to cool and refrigerate. 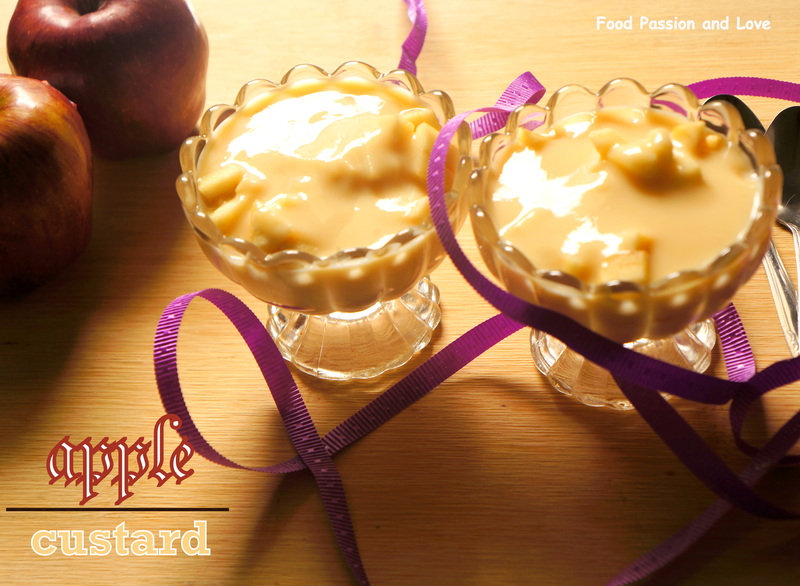 At the time of serving,chop the apples,add it to the custard and serve chilled and Enjoy!! This entry was posted in Uncategorized and tagged afternoon snack, Apple custard, chilled desserts, custard powder, easy desserts, eggless, fruit custard, Vanilla. Halwas are one of the most popular and loved Indian sweets..There are many kinds of halwa made from different ingredients like Flour,Fruit etc…!The halwa recipe I am sharing here today is a total variation..!Its Bread Halwa !Sounds new?It is something I developed with left over Bread(Not Stale Bread).Its a perfect -to- go halwa recipe for Moms like me who are always in a hurry burry 🙂 My kids and hubby just loved it.Do try it out.You will love it! Soak the cashews in a little warm water for about 15 minutes and keep aside. Cut the bread in to tiny pieces. Heat ghee(1/2 cup) in a pan.Add the bread pieces to this and roast till a golden brown on low to medium flame,tossing it frequently. Meanwhile boil the milk with sugar. Add this milk to the roasted bread pieces.Bring this mixture to a boil and then turn the flame to low,allowing it to cook for a few minutes,mashing the bread pieces with a big spoon as it gets cooked. Grind the soaked cashewnuts with a little water to a smooth paste. Add this to the cooked bread-milk mixture,along with the 2 tbsp of ghee and combine well on low flame until oil appears on the sides.Turn off the flame.Transfer to serving bowls.Garnish with slivered almonds.Serve and Enjoy! 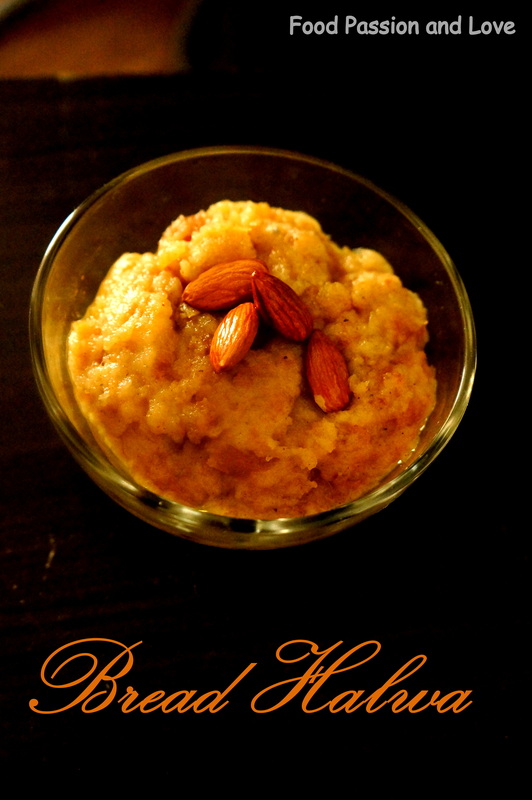 This entry was posted in Uncategorized and tagged almonds, Bread, bread halwa, cashewnutpaste, easy halwa recipes, fuss free halwa, Ghee, halwa, how to make easy halwa, Indian halwa recipes, vegetarian. Hello there!Hailing from the beautiful backwater surrounded Kuttanad in kerala,the dishes usually prepared by my mom had been the typical syrian christian ones..with Non veg mostly sea-food being compulsory three times a day..!Believe me…I am telling the truth…Taken after my mother or Amma as I call her..we too cant almost do without Non- Veg in our diet..well atleast for lunch and dinner. Recently after reading a newspaper article on health,me and my hubby decided to avoid meat for two entire weeks..So it would be sea food instead..Fish,Prawns,crab etc..The fish curry I usually prepare at home is the typical Kottayam Style Red Fish Curry..I love it and can never ever get fed up of it…ever..same goes for my 3 kids too.. 🙂 .Occassionally I prepare Thenga aracha Meen curry~Trivandrum Style for my husband..when he craves for Mil’s Fish curry. 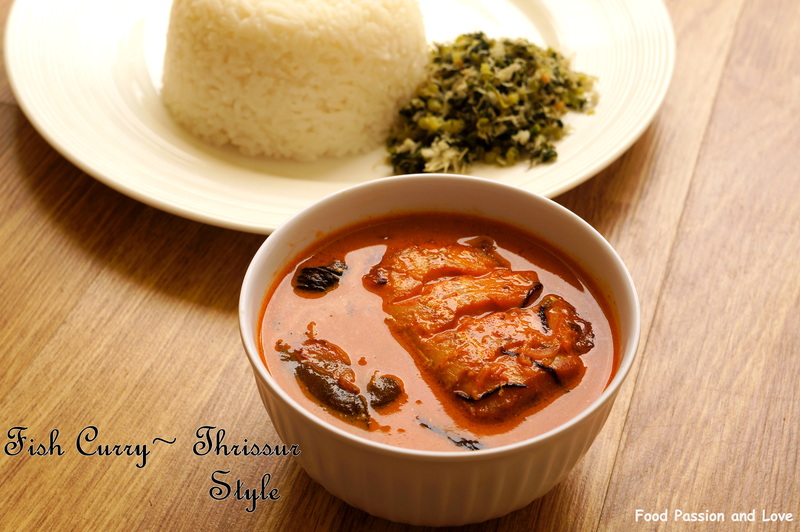 One day ,my hubby told me about the Fish curry he had eaten on his visit to his friend’s home in Thrissur during his college days..Eversince he has been asking me to prepare that for him.I asked my friend here who hails from Thrissur and she gave me the recipe.What my hubby said was true!Its extremely delicious!! Chilli powder – 1/2 tsp. Wash and soak kudampuli in 1/4 cup of warm water and keep aside. Take a manchatti/deep pan.Pour the coconut milk(make coconut milk by adding 2 cups of water ) into the kadai and add chilly powder,turmeric powder,ginger-small onion crushed mixture ,salt, curry leaves,and kudampuli and Mix well. Allow the fish to cook till the gravy becomes thick …When the curry is 3/4 th done add green chilly slits and curry leaves..
Let the gravy become neither too thick nor too thin (a semi medium gravy).Add more salt if required.Turn off the flame once the fish gets cooked.Keep aside. Heat a pan and add 2tsp of coconut oil ,add a sliced shallot and saute well.Now add chilli powder and fenugreek powder.Turn off the flame and pour this into the Fish curry.Serve hot and Enjoy!! I suggest allowing this fish curry to sit for a day in the fridge and serving it the next day.The flavours merge and becomes more tasty that way! This entry was posted in Uncategorized and tagged ammas special, fish curries of kerala, Fish curry, Kerala ruchi, kokum, kudampuli, meen curry, Seafood, Thrissur meen curry.